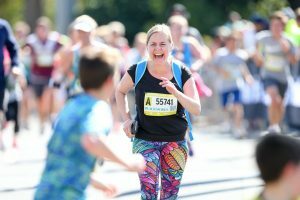 Blackmores Sydney Running Festival – Everything you need to know! The Blackmores Sydney Running Festival is a legacy of the Sydney 2000 Olympic Games. It started in 2001 when the NSW Government approved the continuation of a marathon in Sydney to promote fitness and health for the NSW community and to position Sydney as an international tourist destination. 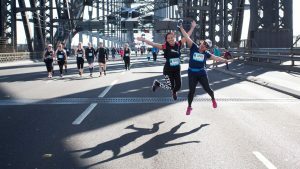 The Blackmores Sydney Running Festival is run on one of the most spectacular courses in the world, taking in all of the Sydney iconic landmarks and providing all runners with the unique opportunity of crossing the Sydney Harbour Bridge – traffic free! 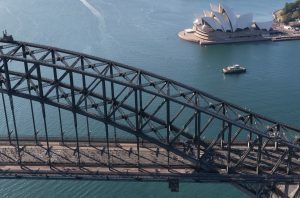 Picture shows images shot from a helicopter during the 2017 Blackmores Sydney Running Festival. The event is open to anyone and there are four different race courses to choose from: Sydney Marathon (42kms), the Half Marathon (21kms), the Bridge Run (10kms) and the Family Fun Run (3.5kms). Whether you are an elite athlete, club runner, gym member, or simply someone who enjoys a social walk or jog there is a run to suit all fitness levels. Race day is on Sunday, 16 September 2018. We know you are passionate about neuroscience research so we’re inviting you to run for NeuRA and raise money for a great cause. If you choose to fundraise for NeuRA you will receive a free NeuRA team singlet and if you meet the fundraising target of $500 your registration is on us! That’s FREE registration! Registration fees range from $35 – $194. Kids under five can run for free. If you fundraise for NeuRA and make it to $500 you can RUN FOR FREE. ‘Run for Free’ is a fundraising initiative. Once you meet your $500 target the cost of your ticket will be rebated to you. Once you’re there you can register for any of the four races or set up a team for your friends and family to run with you. The Family Fun Run is a great way to spend a day out with family and friends. Walk, run or dance your way over the Sydney Harbour Bridge and raise vital funds for neuroscience research. The Family Fun Run is approximately 3.5km and starts at 9:00am. There are no age restrictions for the Blackmores Family Fun Run. Simply show your chest bib to access public transport on event day. Please contact the Transport info line on 131 500 or visit www.transportnsw.info for information on early morning bus or train services. The start area is right outside Milsons Point Station.